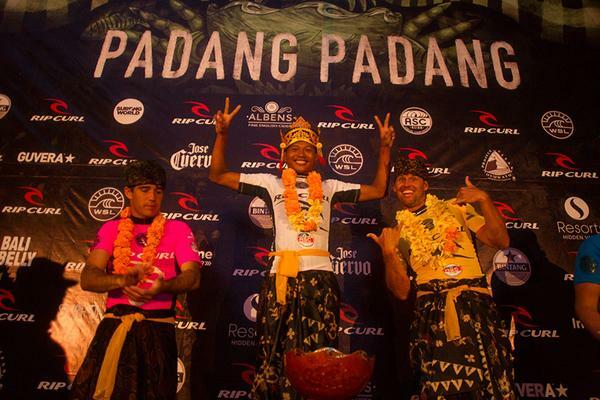 Bali, Indonesia – In an event dominated by the international invitees, Mega Semadhi was the lone local Indonesian surfer to reach the final of the 2016 Rip Curl Cup at Padang Padang. But when the final horn sounded, it was Mega who came out on top, claiming his second title in the past three times the Ultimate Tuberiding Contest has been held. Rip Curl is one of the world’s most recognized and respected brands, consistently at the forefront of the surf and snow scenes since its creation in the late 1960s. The Search is the driving force that led to the creation of Rip Curl. It's the one true thing that Rip Curl has that no one else does and it lives in the spirit of everything the Rip Curl crew do. It's what makes Rip Curl unique. It defines who we are. Rip Curl remains a company built by surfers for surfers. Endeavoring to make the best products, run the best events, support the best athletes, deliver the best customer service, communicate the best brand message and socialize with the best crew of people helps Rip Curl hold a vision of being regarded as The Ultimate Surfing Company. With 3x WSL World Champion Mick Fanning, 2014 WSL World Champion Gabriel Medina, and fellow team riders Owen Wright, Matt Wilkinson, Tom Curren, Tyler Wright and Alana Blanchard all surfing with Rip Curl, and a global events platform including the historic Rip Curl Pro Bells Beach, Rip Curl Pro Portugal and the unique Rip Curl Cup Padang Padang, the brand is the leader in professional surfing. The Rip Curl Cup Padang Padang 2016 is sponsored by: TELKOM INDIHOME, HIDDEN VALLEY RESORT, BINTANG, JOSE CUERVO and ALBENS CIDER. Media partners: Coastalwatch.com, Surfing World, SurfTime, BaliBelly.com, Indosurflife.com, and Guvera. Rip Curl is proud to support Project Clean Uluwatu, the non-profit organization working to keep Bali’s beaches clean.